Waitress service all night from 7pm at reserved tables on the floor of the arena as close to the action as you can get. Raymond van Barneveld came out on top in a thrilling encounter with Peter Wright in the fifth round of the Speedy Services UK Open. The five-time World Champion won a last leg decider to see off an almighty challenge from ‘Snakebite’ at Bolton’s Reebok Stadium on Saturday evening. “I was lucky in the end but I am pleased to be through,” said van Barneveld. “I feel sorry for Peter because he played a brilliant game but I dug in and go the result. 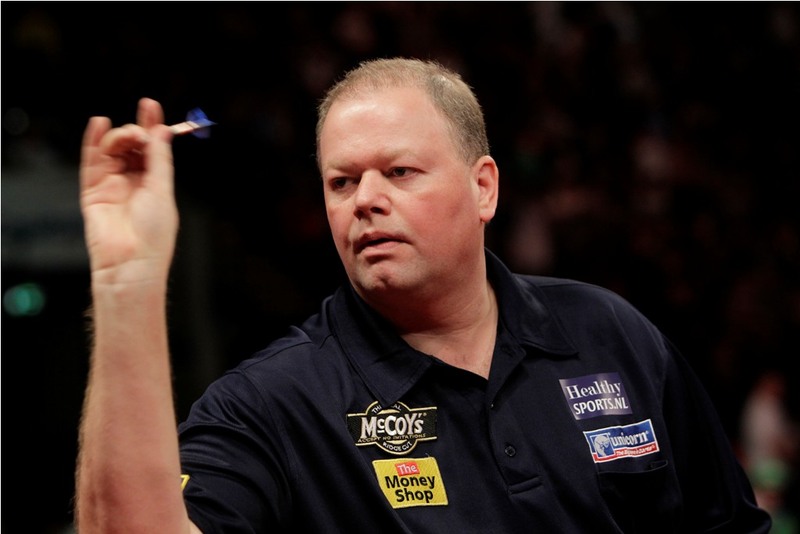 van Barneveld hit double six to take the first leg, but Wright hit back to win the next two. ‘Barney’ hit double 19 to level and the next four legs went to throw, before three consecutive breaks gave Wright a 6-5 lead. Wright held to extend his advantage, but Barney hit back with his second 180 before taking out 51 to keep himself in it. The Dutchman missed his double for a 156 checkout, as Wright put himself within a leg of a place in the quarter-finals. van Barneveld started the next leg with a 180 and took out 80 to pull it back to 8-7. Wright, throwing for the match, bust his score when on a finish of 138 and van Barneveld punished him, taking out 60 to force a last leg decider, in which he would throw first. See Barney in the Charlton Masters on Thursday 19 July. Raymond van Barneveld produced a wonderful performance to defeat 2012 World Championship finalist Andy Hamilton in round four of the Speedy Services UK Open at the Reebok Stadium. The popular Dutchman hit three ton-plus finishes and averaged 102 in a dazzling display to put himself into the last 16. “I knew what I was up against,” said van Barneveld who is yet to lose to Hamilton on TV. “He had a great World Championship and Premier League so I’m happy with the win. “He took out two bull finishes, which annoyed me, so I was pleased to win it with the 126 checkout. ‘Barney’ won the first leg before ‘The Hammer’ levelled after hitting the game’s first maximum. van Barneveld then took out two fabulous 109 checkouts back to back to race into 3-1 lead, which he quickly increased to 4-1 by holding his throw. The five-time World Champion continued to turn on the style, hitting double eleven for a break of throw before moving 6-1 ahead with a stylish eleven darter. ‘The Hammer’ announced his presence in the match, throwing back to back maximum’s to pull a leg back, followed up by a sensational 170 checkout. ‘Barney’ broke straight back with a neat 97 checkout. Hamilton took out 81 to reduce the Dutchman’s lead to 7-4 but van Barneveld broke back immediately again, hitting double top to leave himself throwing for the match. Hamilton managed to keep the match alive by breaking van Barneveld’s throw, but Barney broke back once more, finishing the game in style with a 126 checkout. Raymond van Barneveld booked his place in round four of the Speedy Services UK Open with a convincing victory over fellow Dutchman Jelle Klaasen. ‘Barney’ cruised to a 9-3 victory over his compatriot, hitting four 180′s in the process, to set up some confidence for the weekend. “He let me in early on and I never looked back really,” said van Barneveld, who topped the tournament’s qualifying rankings. ‘Barney’ settled in quickly, hitting double sixteen with his first attempt at a double, and soon raced into a 4-1 lead, hitting his first 180 in the process. The Dutchman won the next two legs after the break to close in on victory. Klaasen pulled a leg back before van Barneveld turned on the style, hitting back to back 180′s before missing the seventh treble. He cleaned up 100 for an superb eleven-dart leg. ‘The Matador’ reduced van Barneveld’s lead to 7-3, before the five-time World Champion produced a brilliant 110 checkout. ‘Barney’ wrapped up a comfortable win, hitting his fourth 180 in the final leg. 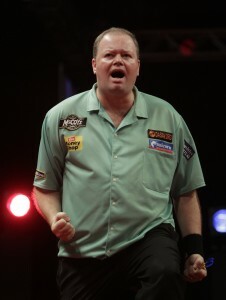 van Barneveld face Premier League semi-finalist Andy Hamilton in roun four on Saturday afternoon.